Though the seasonal changes in much of Florida are milder than many other states, they still exist and spring still symbolically represents a time where rainfall causes flowers to bloom and greenery to become lush and full again. But while April showers may bring May flowers, they can also bring car accidents. In this part of the country, torrential rain is a common occurrence, meaning that it is not uncommon for there to be at least three inches of rain in a single day especially along the Florida coastline. And generally speaking, rainstorms are heavily concentrated in the warmer months which we are quickly approaching. How Much of a Driving Hazard is Rain? Surprisingly it isn’t snow and ice that are the most deadly driving hazards. Instead, according to the Federal Highway Administration, rain is the worst weather condition that you can encounter while driving. Over 21 percent, or 1.2 million of the 5.8 million crashes that happen every year in this country are related to adverse weather. And the overwhelming majority of these weather-related crashes happen on wet pavement and during rainfall with 70 percent occurring on wet pavement and 46 percent occurring during rainfall. These impacts can lead to tragic results as, on average, nearly 5,000 people are killed and over 418,000 people are injured in weather-related crashes each year. How Can I Use Extra Caution When Driving in The Rain? Slow down. Your safety and the safety of other drivers is more important than anywhere you may be tempted to speed too. 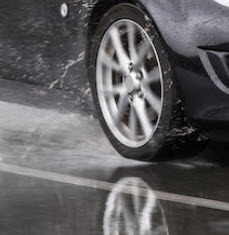 Instead, put plenty of space between your vehicles and others on the road just in case your vehicle hydroplanes. Use your turn signals. This adds an extra level of visibility for other drivers on the road. Make sure that you allow ample time between when you trigger your signal and when you actually begin merging lanes. Maintain your vehicle. Regularly change your tires when they get worn out and make sure that you keep your windshield and windows cleaned regularly so that you have the maximum amount of visibility. Avoid distracted driving. Put your phone down, turn off the radio, and keep conversation with your passengers to a minimum until you are safely out of the adverse weather conditions and in an area where the roads have dried. Do not drink and drive. While ingesting mind altering substances before getting behind the wheel is never a good idea, it is an especially poor one when it is raining. It is already more difficult to react to changing conditions when it is raining and impairment heightens this. Have You Been Injured in an Accident in the Rain Because of Someone Else? Unfortunately, drivers sometimes fail to adjust their driving to adverse weather conditions which can cause an accident leading to your injuries. The Florida attorneys Leifer Law Firm have helped many people pursue the compensation that they deserve during their 25 years of combined experience and we can help you hold the responsible parties responsible. Contact us today for help and we can begin helping you hold the responsible parties accountable.